The US Virgin Islands is an unincorporated territory of the United States located approximately 1250 miles south-southeast of Miami, Florida, USA and 50 miles southeast of San Juan, Puerto Rico. Consisting of three islands named, St. Thomas, St. John, and St. Croix, the islands are a heavily visited tourist destination and the vacation home to many of the world's wealthiest. St. Thomas houses the largest and most heavily utilized airport and shipping port. The other two islands, while open to the public, are a bit more secluded. First named by Christopher Columbus in 1493 for Saint Ursula and her virgin followers, the islands now named St. Thomas, St. Croix, and St. John are famous for their white sand beaches, crystal-blue waters, and tropical warmth. After being conquered and traded among several European countries for many years, the islands were purchased by Denmark in the late 1600s. Several settlements and outposts were built by the Danish West India Company and in 1754, the islands officially became Danish colonies. Sugarcane became the primary product of the islands fueled by slave labor. This was a very lucrative business for the Denmark until the rising tide of abolitionism swept across the Caribbean Islands in the middle 1800s. The profitability of the sugarcane business on the islands declined resulting in Denmark seeking to sell off their holdings. No real interest was found until the strategic location of the islands made them desirable to the USA during World War I. 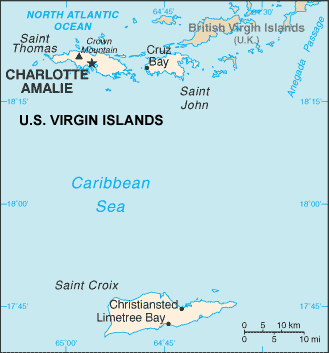 The United States purchased the islands in 1917 officially naming them The Virgin Islands of the United States and granting US citizenship to the inhabitants. Steeped in maritime history and remnants of the many European, African, and Caribbean cultures, the U.S. Virgin Islands remain one of the busiest cruise ship ports and family vacations destinations in all of the Caribbean. Covered with red tile-roofed buildings and houses, the capital city of Charlotte Amalie sits amidst lush green hills, and is widely considered one of the most beautiful ports in the Caribbean. The US Virgin Islands is an unincorporated territory of the United States located approximately 1250 miles south-southeast of Miami, Florida, USA and 50 miles east-southeast of San Juan, Puerto Rico. Situated in the junction of the Caribbean Sea and Atlantic Ocean, the islands are dominated by tropical weather conditions year-round with very little variation. Situated in the junction of the Caribbean Sea and Atlantic Ocean, the US Virgin Islands are dominated by tropical weather conditions year-round with very little variation. The temperatures are moderated somewhat by the easterly trade winds and they have a rainy season from September through November. The islands are mostly hilly and mountainous terrain that gives way to rocky coastlines with an occasional white sand beach. Virgin Islanders are 76% black, 13% white, and the remainder is made up of Asian and/or mixed races. They speak English predominantly with some speaking Spanish Creole or French Creole and 90 to 95 percent of the population is literate. Slightly more than 105,000 people live in the islands with the majority being between the ages of 29 – 54. The islands are experiencing a stagnant population growth rate currently. Tourism is the primary economic activity for the islands providing 80% of GDP and employment from hosting 2.5 million visitors annually. The manufacturing sector is somewhat robust consisting of petroleum refining, rum distilling, textiles, electronics, pharmaceuticals, and watch assembly. One of the world's largest petroleum refineries is located at Saint Croix. The agricultural sector is small resulting in most of their food being imported. International business and financial services are small but growing components of the economy. The government is working to improve fiscal discipline, to support construction projects in the private sector, to expand tourist facilities, to reduce crime, and to protect the environment. The islands are vulnerable to substantial damage from tropical storms causing the need for somewhat continual repair and restoration of buildings, houses, and parks & attractions. Roughly 30% of the population is considered to live below the poverty level. There is a stark contrast in the lifestyles of the wealthy vacation home owners, resort vacationers, and the local townspeople. Many children and teens supplement their family's income by selling unofficial guides and brochures in addition to handmade crafts & souvenirs. Many of the local residents work in the resorts and attractions on the islands. All modern conveniences of western society are available on the islands particularly on St. Thomas and in the resort areas of the other islands. The international calling code to reach the islands is 340. Mobile telephone service is available throughout most of the land mass of the islands and much of the waters surrounding the islands. Along with internet, fax, telephone, and mobile communications, the islands also house 12 local television and 24 local radio stations. Cable and satellite TV and radio are also available. The US dollar is the currency used and credit cards are readily accepted. Travel to and from the Islands is made possible by two airports with paved runways located on St. Thomas and St. Croix and five sea ports. Roadways cover significant amounts of the islands. Taxi service is available and recommended in the tourist-oriented areas of the islands. From a religious perspective, the people of the US Virgin Islands are categorized as follows: Protestant 59% (Baptist 42%, Episcopalian 17%), Roman Catholic 34%, and 7% of various other beliefs/practices. The degree to which the adherents are faithful to their belief system and the degree to which the belief systems are orthodox is unknown. It is also noted that in the Caribbean islands, the presence of Voodoo, Santeria, and other folk religious practices can be commonly found in certain areas. The islands should be easily accessed by Christian missionaries due to the heavy representation of Christian and Catholic churches. Like all locations throughout the world, the US Virgin Islands need clear and consistent teaching of the word of God along with patient and sincere examples of Christian leadership. As is common for nations consisting of many islands, the people in the remote parts of the islands may not have access to the same conveniences and supplies that are available to people in the more heavily populated areas. 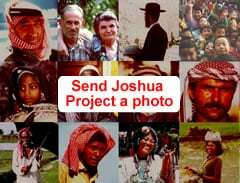 Supplies of educational materials, medicines, foodstuff, clothing, and housewares could be beneficial to them. Research was conducted from the permitted use of the following internet sites and some information obtained by personal observation was used. https://www.cia.gov/library/publications/the-world-factbook/geos/vq.htmlView Virgin Islanders, English-Speaking in all countries.